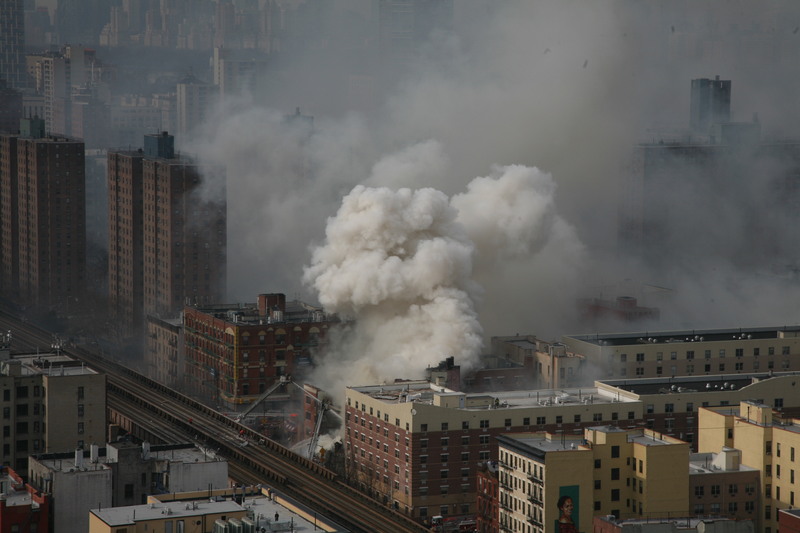 Thankfully nobody was injured in a Manhattan gas explosion. An electrical malfunction in a Con Edison transformer caused a carbon monoxide leak in a building located on 2465 Broadway between 91st and 92nd Street in the Upper West Side. The leak started around 4:00 pm and was discovered when the alarm of the Equinox gym located in the building went on. 90 people including clients at Equinox and three other businesses as well as 15 tenants were swiftly evacuated before an explosion shattered the windows of the building. Witnesses said they saw a big orange flash followed by the explosion. Glass and debris flew across Broadway. People living in the area felt their apartments shake. Animals at next door Petco were all safe as well. The firefighters thought the alarms had been triggered by a smoking transformer inside the Equinox Gym basement but then they detected high levels of carbon monoxide and found that a carbon monoxide leak from defective ConEd equipment under the sidewalk. The gas and electricity were shut off on the block. Yesterday morning the gas was still turned off as investigators were still figuring out what happened. It was fortunate that everybody could be evacuated before the explosion occurred. Carbon monoxide gas leak are extremely dangerous and very easy to ignite. Any spark caused by even a telephone ringing or a light switch being turned on can trigger an explosion. 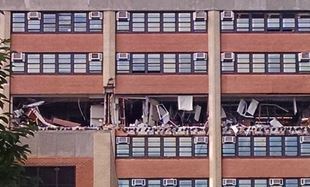 A construction worker was critically injured and two others suffered serious personal injury in a gas explosion that rocked the walls of the science lab at John F. Kennedy High School in the Bronx, NYC. 36 year Luigi Barillaro, 38 year old James Intriago and 53 year old Charles Marullo, were all working for the plumbing and heating company Mar-Sal Plumbing & Heating Inc., based on Pitkin Avenue in Ozone Park, Queens, NYC. The company was hired to install a tabletop gas valve as part of a science lab construction project located on the sixth floor of the building. The 3 men had been working all day and the room was filled with gas but they apparently didn’t detect the smell of gas because they had been desensitized to it. At one point Luigi Barillaro lit a match to check if the gas was working, sparking a huge explosion, blowing out the walls and sending debris flying 200 feet. Barillaro was critically injured and had burns over most his body. He has already undergone multiple skin-grafting surgeries. Intriago and Maruallo were also still in the hospital and being treated for burns to their arms and faces. The school was issued a full vacate order for the entire building and a safety zone was put in place along some facades. Students who were supposed to start school there on September 9 will have to be temporarily relocated. A year ago 8 people were killed and many others suffered severe personal injuries in a gas explosion that destroyed two five-story buildings in Manhattan. A vigil led by Council Speaker Melissa Mark-Viverito was held this to mark the anniversary of this tragedy. Cecilio Hernandez, a Mexican immigrant who lost his wife and his daughter in the explosion will be among the attendees with Oscar, his teenager son who was badly injured and spent months in the hospital recovering from his injuries. The family lived in the 1644 Park Avenue building. Four other victims lived in this building: Griselde Camacho, 44, Carmen Tanco, 67, George Amadeo, 44, and Alexis Salas, 22. The two other victims 43 year old Andreas Panagopoulos and 34-year-old Mayumi Nakamura lived at 1646 Park Avenue. The investigation indicates that the ground beneath the building was saturated with natural gas. 16 year old Oscar Hernandez suffered severe personal injury and his mother and sister died in the Harlem gas explosion that destroyed a building on E. 116th street in Harlem, NYC on March 12th this year. The young man spent 11 days in a coma and when he came out of the coma, he needed several surgeries that kept him in the hospital until June 27th. Oscar, his dad and his little sister are the only members of the family who survived the gas explosion. On Thanksgiving all three are happy to be alive and thank all the people who helped them.